There’s been some musical chairs in the realm of Hong Kong’s famous chefs of late. Firstly, one of the highest profile celebrity chefs who helped start the private kitchen trend, Jacky Yu, vacated the premises of his original restaurant Xi Yan in Wan Chai Road. And then, Jacky Chung – executive chef at 90s Cantonese giant, Tang’s Cuisine, which re-opened on the eighth floor of the Hopewell Centre last year before soon closing again – launched the new J & T Restaurant at Jacky Yu’s vacant Xi Yan spot. So, in short, this third floor Wan Chai Road space has swapped one Jacky for another. We’re excited about J & T, though, where J obviously stands for Jacky Chung and T is New Territories celebrity chef Hugo ‘To To’ Leung, who invested in the restaurant. While the red-coloured walls that came to be identified with Xi Yan remain, gone are the contemporary sculptures and artworks from the walls. Instead, they’re replaced with chef Chung’s awards and accolades. When we visit, the décor certainly feels sparse and it’s lost some of its artsy edge, but we’re hoping the food can make up for any loss of ambience. Known for his new-wave approaches to traditional Cantonese cuisine, chef Chung dishes up all-day dim sum alongside barely Chinese offerings like cherry foie gras and roast chicken stuffed with black truffles. We’re a little a disappointed that the signature roast squab has sold out when we’re seated but we set our sights on other featured dishes on the menu instead. 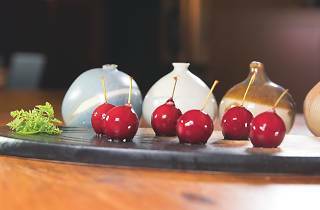 Even though we expect it to be a copycat version of Amber chef Richard Ekkebus’ famous foie gras lollipop, we start with the cherry foie gras ($188). 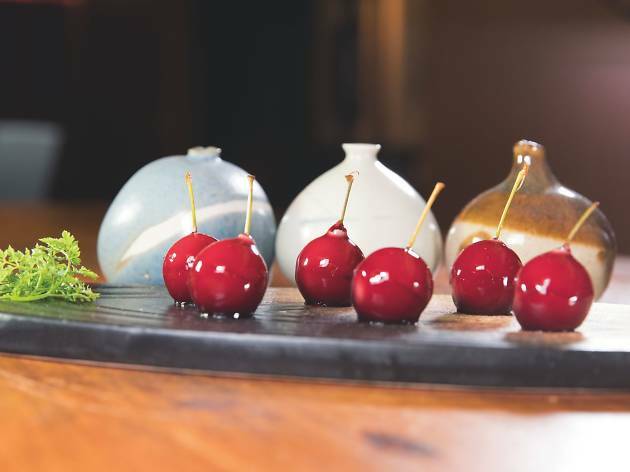 But the morsels of foie gras arrive actually shaped like cherries, plus they taste surprisingly different to Ekkebus’ creations. Where the Central restaurant’s signature item is covered in a beetroot and raspberry jelly, Chung’s is coated in a red wine blueberry reduction that sports a tangy flavour, pairing majestically with the buttery liver ingredient. Our only complaint is that the centre of each ‘cherry’ is still cold. Nevertheless, this is a tasty dish and a decent surprise. Next up, the fried softshell crab ($116 for two) is also a top effort. The golden crispy shellfish is topped with a hot sauce that’s mixed with crab roe. It’s got a kick but it works well as it balances the crustacean’s slightly oily flavours. We’re enjoying ourselves so far. 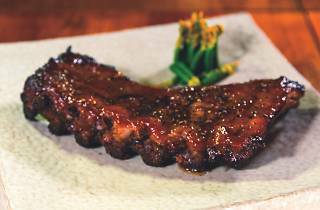 The stars of the evening, though, are the iberico ribs ($268). 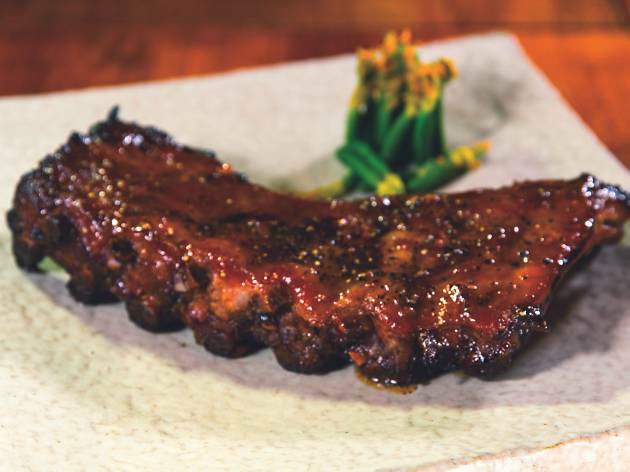 Charcoal-grilled and marinated in a light char siu and black pepper sauce, these meaty delights taste wonderful. The sauce is what makes them, with its aromatic balance of peppery notes and subtle sweetness. We forget decorum and eat every last one with our greasy hands. But then we take a break from the rich dishes and dig into a baby cabbage in stock ($108). It’s good. A showcase of J and T’s old school Cantonese kitchen skills. The soup base is a superior fish stock and only enriches the vegetable. There aren’t any desserts on the menu, so we round the meal off with beetroot fried rice ($128). It’s a letdown, though, despite sporting a magnificent magenta colour. We neither taste nor see any of the root vegetable in the rice, making it a plain affair. A bit like our surrounds, really. Soulless. There’s no doubt that chefs J and T have talent. We certainly sample some stellar dishes here. But, sadly, the restaurant is lacking a personality. The team needs to create a more welcoming, soulful atmosphere and, in some dishes, put more work in to make them as impressive as, say, the cherry foie gras. Jacky Chung has many awards to show how good he is, so if he does some soul-searching and ups his game, then a new star can be born. And that means no more musical chairs at this Wan Chai spot.